Posted November 7, 2007 by grohling & filed under Reports. 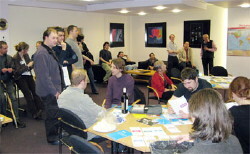 The 7th of November was a showcase night for the Oxford branch of the British Computer Society on its 50th anniversary year, 2007. A stunning venue of Science Oxford was used to promote the services that the BCS offers both its members and non members. Wine and Millets farm cheese was on offer to refresh our guests. The venue offered 2 rooms, a presentation room which was manned by committee members offering information and advice to those who sought to find out more about the BCS. Lots of leaflets and other information packs were available along with some fun BCS 50th branded items for our guests to take home. 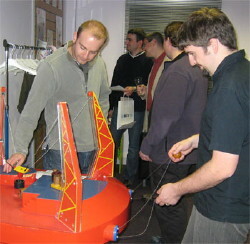 Meanwhile upstairs in Hands on guests were toying over the puzzles and exhibits on offer from 8 till 9 p.m. Many mini competitions and quizzes were held over the evening. These included a facts based quiz for the visitors to hands on and a wine tasting quiz in the main presentation room. Come the end of the evening at 9 p.m prizes were given out for participants. Seven BCS branded carry bags were won by those who scored highly in the ‘Hands on’ quiz. A BCS branded Cross pen set was won in a BCS knockout quiz. Theatre Vouchers were won by the luck of Bingo balls and we presented the winner of the wine tasting competition with a wine tasting guide CD. In total near 50 people attended with a spread of members, non members and a good presence from our YPG membership. Lots of fun was had by all, not least the organisers and we wish to thank our membership for a wonderful 50 years and hope we continue to go from strength to strength.